The Cannabis industry is in a state of rapid change and States are quickly shifting regulations and requirements for companies in the business. 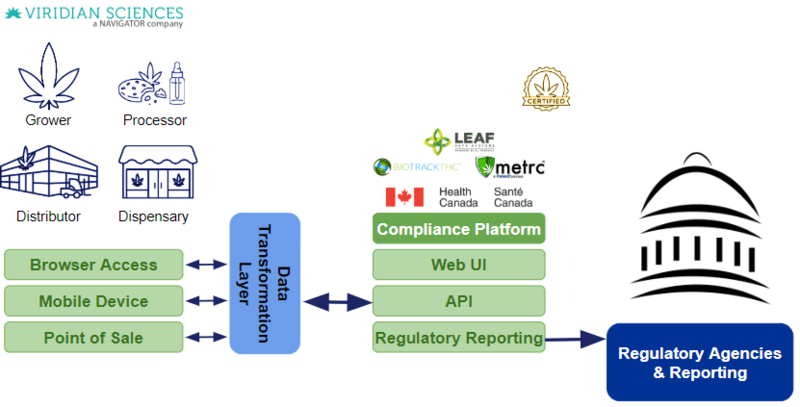 Viridian Sciences has been developed to integrate with any required compliance system (State developed or third party State contracted) to enable reporting. Within this evolving environment, it is reassuring to know you are running a trusted system that automates the compliance reporting for you. One that will help keep you up-to-date with regulations and requirements for each country, state or city. Viridian Sciences has been designed to handle multiple locations as well as multiple in industry verticals (grower, processor, distributor or dispensary) meaning that companies that operate across multiple jurisdictions have one system to ensure compliance by integrating to multiple systems if necessary. All companies plan to expand and grow. The Viridian Sciences software is designed to be flexible and scalable to grow with your business. Regardless where the growth takes you, into new business lines or new regions by adding the needed integrations to seamlessly support your transition into a new market Viridian Sciences will be there to assist you..
Watch a live webinar to see the product in action. What is Viridian Sciences Cannabis Business Software? Watch the video overview below. We provide access to our cannabis business software on any internet connected device, including TVs, Desktops, laptops, tablets, and phones, and can operate on Windows, Mac, or Linux. Our partnership with technology’s largest names allow us to provide a secure connection to all of our products. We fully believe “The real power is in the data.” With an unlimited amount of possibilities, we can help you look deeper into the data behind your business with built in reports, custom Crystal reports, Excel, SQL and more. Any true enterprise resource planning (ERP) solution offers material requirements planning (MRP), production planning, scheduling, and an inventory control system used to manage manufacturing processes. Start to predict and plan your business instead of only reacting. Viridian Sciences offers all-in-one business management software solutions for the cannabis industry. Built on a framework of security, you can be assured that your company remains safe and compliant. Our mission is to help you grow your business by providing the world's leading enterprise resource planning technology while helping your company adhere to government regulations with complete legal compliance.